For a card to lose the likes of Jon Jones and Khabib Nurmagomedov and still be referred to as "stacked" is unheard of. But UFC 187 has broken that rule. While the greatest pound-for-pound fighter on the planet clashed heads with the law once again, the Light Heavyweight Championship will still be up for grabs when UFC 187 emanates from the MGM Grand Garden Arena, featuring Jon Jones most established and recent challenger in Daniel Cormier, and what would have been his most feared, in the animal that is Anthony "Rumble" Johnson. That tops the bill, but in a seismic Memorial Day Weekend in Las Vegas, Vitor Belfort will finally get his shot at Chris Weidman's Middleweight strap, ending an agonising wait of more than a year of TRT controversy and injuries. And if, somehow, two huge title fights are not enough, then there's plenty more to feast on, including a Lightweight bout of title implications between Donald Cerrone and John Makdessi, a Heavyweight slugfest between Travis Browne and Andrei Arlovski, along with Flyweights John Moraga and Joseph Benavidez squaring off inside the Octagon. With breakdowns from the standup to the mat, vital predictions to bank on and much more insight, we preview UFC 187: Johnson vs. Cormier. Striking advantage: Johnson — Rumble should have the edge on the feet. He is much more technical than Cormier. He has huge one punch knockout power along with excellent kicks. Rumble carries bigtime power early in the fight that not too many fighters can withstand, as shown in his victories over Lil Nog and Gustaffson. His takedown defense has always been good but ever since training with the Blackzillians his ability to stuff takedowns has gone to another level. Cormier isn't a bad striker in any sense but it's not his game. He uses punches to set up clinch opportunities and takedowns to get the fight in his realm. He does have decent power and technique though and shouldn't be underestimated. Grappling advantage: Cormier — Despite his performance against Jon Jones, Cormier has shown that he has some of the best takedowns and wrestling in MMA. Majority of Cormier's work takes place on top where he is smothering with pressure and top control. On Paper Cormier is the better grappler due to him being a D1 All-American and former Olympian. Johnson, on the other hand uses his wrestling in reverse to keep the fight standing. He has excellent wrestling himself as he is a former junior college wrestling champ, but Cormier definitely has better offensive wrestling. As for submissions, neither guy is a major threat. Johnson doesn't have a submission game as he prefers to punch and the same goes for Cormier, despite a submission win over Dan Henderson. Breakdown: This fight came unexpected but it is a fantastic matchup! Although Johnson has had his setbacks at 170, I don't even take those losses into account due to his bad weight cutting and his new personality. Rumble has been a savage and perfect since going up to 205. His full arsenal of skills are finally on display. There is no secret as to what Cormier want to do:take Jonson down. keep him down, and grind out a win. Although Cormier is coming off a very disappointing loss, he is extremely motivated for this fight. Both guys love to come forward and be the aggressor, but this could be detrimental for both as Rumble has the power to put DC down coming in and DC can take Rumble down if he overextends himself. I think this fight will turn to a grappler vs striker match really quick. I doubt DC tries to stand with Johnson for too long. DC wants to push him against the fence and wait to see if Rumble tires out. All in all, I see Rumble being able to stuff Cormier's shots and stay off his back. I just think this is Rumble's time to shine. I see him catching DC with something heavy in the 1st round. Striking advantage: Belfort — Vitor is one of the most devastating strikers in the UFC today and probably in it's history. Whether its his his left high kick, spinning back kick, or his clean punches, one clean shot landed by Vitor usually means that the fight is over. Weidman's standup game is steadily improving, but he just doesn't have anywhere near the striking experience or comfortability that Vitor has. Weidman doesn't have the best flow or combos, but he does have a good understanding of range. I didn't like what I saw from him in the late rounds vs Machida on the feet, and with Vitor's power you cant make too many mistakes. All in all, I don't see Weidman posing too much of a threat to Vitor on the feet. Vitor has better use of range, better punches, kicks, and the better arsenal. Considering he trains with Glory kickboxers, Tyrone Spong, and Anthony Johnson, I just can't see how Weidman beats Vitor by a KO or TKO. Although Weidman has never been outstruck in a fight, the type of power Vitor has will make Weidman really cautious and really look to initiate grappling situations immediately. Grappling advantage: Weidman — Weidman definitely is the better wrestler with better takedowns and positioning. Vitor has been a black belt since he was 19 years old and besides the Jon Jones fight, hasn't really been in any type of trouble on the ground. If the fight does hit the mat, I think Weidman can get the better of scrambles, but I don't think he can submit Vitor. I'd like to think Vitor is a better grappler than Machida, and Lyoto was able to stay out of Weidman's subs. Vitor is acutally underrated off his back, but I don't see him posing a threat to Weidman in that area. Weidman has to be able to avoid big shots from Vitor and get in close range. I actually think the long layoff hurts Weidman's gameplan to take Vitor down because that's his biggest chance to win the fight. Its highly unlikely Weidman knocks Vitor out, so I am sure Vitor stuffed thousands of takedown attempts in camp. I understand Weidman is a world class wrestler but I think the best shot he has to take Vitor down is against the fence. I think if he shoots typical normanl double legs and single legs he will be unsuccessful. If it does hit the mat though, I will give Weidman the edge just based on his hard nosed will and top control, but Vitor can hold his own. Breakdown: The big question is how will Vitor perform without TRT? My gut feeling says not much by the training I've seen him doing. TRT or no TRT, skills are skills, and you have to respect that from Vitor. Weidman can solidify hes a top P4P fighter in the sport with a win, and Vitor can solidify himself has being one of the greatest ever with a win over and undefeated Weidman. I think Weidman will be cautious early and try to push Vitor against the fence and look for takedowns, but I am sure that was the main focus of Vitor's camp. Vitor will try to do what he normally does and that is control distance with flashy kicks to keep Weidman at bay and take him out with strikes. No knock on Weidman's game at all, but I think the layoff will affect him in this fight. I actually think this will a be a convinving performance from Vitor. Vitor has had over a year to prepare for Weidman and to get his takedown defense ready. I have faith that Vitor will stuff most of his shots or get right back up. Like I said this is no knock on Weidman's game but I think Vitor should be able to have his way the longer the fight stays standing. Striking advantage: Even — Both guys are world class kickboxers, but Makdessi is a bit more accomplished in kickboxing. We all know the deal with Cowboy: He starts slow and stands straight up in the beginning of fights, but as the fight progresses he hits a switch and his full arsenal of strikes come out. He does it every fight, whether it was against Barboza, Miller, Alvarez, etc. He's just a slow starter and he can't help it. 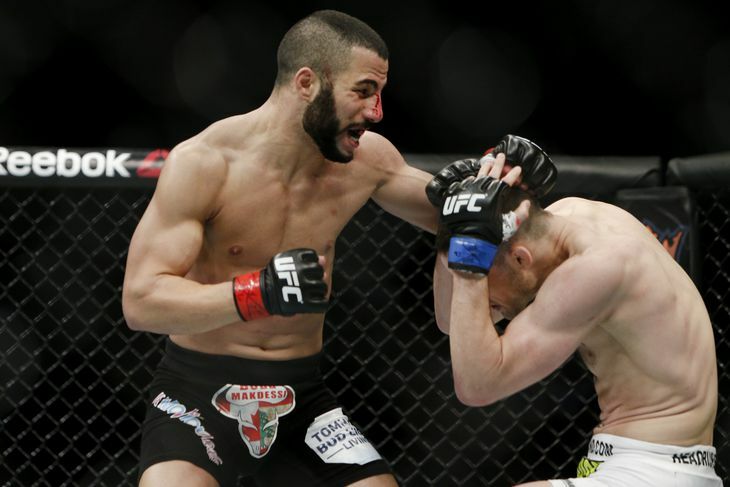 Makdessi has a pretty short reach for a 155er and tends to throw a lot of sidekicks and hook kicks to close distance. Grappling advantage: Cowboy — Cowboy definitely takes the edge on the mat. Grappling is the biggest weakness in Makdessi's game. Cowboy has a sick submission game and very underrated wrestling in my opinion. He can pull off subs with his long limbs with ease. Breakdown: Although this isn't the most high profile matchup, this is the biggest and riskiest fight in Cowboy's career. Makdessi has a huge opportunity to crack the top 15 with a win here coming off a tko win over K-1 level striker Shane Campbell. I did think Cowboy lost his last fight but he was extremely active and probably drained. Cowboy has a history of choking in these type of fights as well, but with the opponent change I think it helps him out. I think most of this fight stays on the feet and in-fact gets very wild early. You could see Makdessi rock Cowboy early, but Cowboy will control the final 2 rounds with his excellent Muay Thai. This could be very similar to the Anthony Njkouani fight if he can't get inside. Cowboy will weather the early storm and pick up a decision win on route to a rematch with Dos Anjos. Striking advantage: Browne — I would say Browne has the edge on the feet in this fight. He's an extremely long heavyweight and has good weapons like his overhand right, push kicks, superman punches, and of course his elbows. Arlovski is a very quick and agile guy for a heavyweight but his strikes are pretty straightforward and nothing too special. His great movement allows him to land at angles that HWs generally don't land from, but Travis' unpredictability, power edge, and more weapons give him the edge. 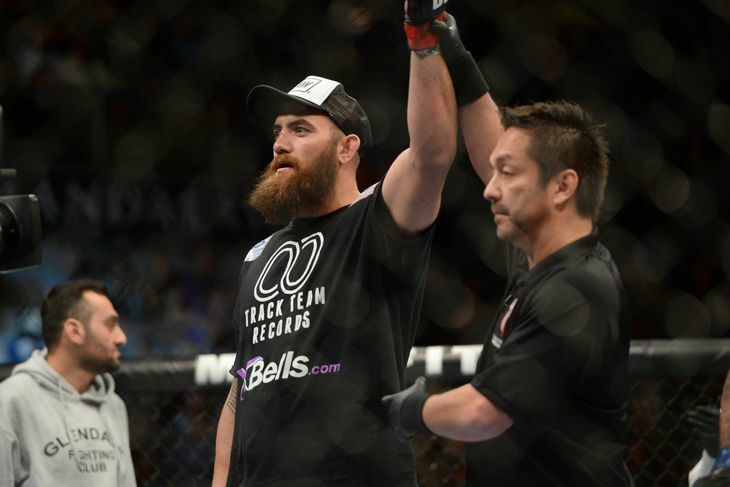 Grappling advantage: Browne — Despite the Werdum fight, Travis defends most tadedown attempts, and he has the ability to attack from awkward positions. I highly doubt Arlovski tries to take this fight to the mat, he generally uses a stick and move style. Breakdown: Browne is amongst the top contenders at heavyweight, and with an impressive win he can either get a title shot or end up in a #1 contender fight vs Stipe Miocic. Arlovski wants to steal all of Browne's thunder. I expect most of this fight to stay on the feet. Arlovski wants to throw a couple of punches at a time and move out of range and stretch the fight out to see if Browne slows down. I expect Browne to be really aggressive in this fight as I am sure he knows Arlovkski's game very well considering they're former teammates. thein all, I think this fight is closer than people think, but I think Browne is more dangerous in every aspect of striking. Arlovski is game and has the ability to pull off an upset, but not in this fight. Striking advantage: Benavidez — Neither guy is that much of a fluid, devastating striker, but I give Joseph the edge on the feet based on a power advantage. Joseph's striking hasn't developed over the years as I would have expected it to, but his power remains constant. Moraga is straightforward and nothing special but he's tough and wont hesitate to stand in the pocket. He only has 2 KOs on his record and primarily uses his strikes to set up grappling exchanges. Grappling advantage: Benavidez — Moraga is very slick on the mat and has nice submissions, and he proved this against guys like Justin Scoggins, Willie Gates, and Chris Cariaso. Unfortunately for Moraga, Benavidez is on a different level compared to the guys he's subbed. Benavidez has never been subbed in his career as well and has a couple of submission wins over high level black belts back in the WEC days over Wagney Fabiano and Miguel Torres. I think Benavidez has better subs, transitions, and wrestling. Breakdown: Both of these guys have lost to the champ, but in the shallow 125lb divison anything can happen. If John Dodson were to win on this card I assume he'd be next for a shot at the belt, but the winner of this fight could be in a contender fight with Henry Cejudo if he were to beat Chico Camus. I think a lot of this fight will take place on the mat and I think we will see some crazy scrambles and guillotine attempts. I see Benavidez being better everywhere and doing enough to win. Moraga is a tough customer and wont back down, but Benavidez is almost perfect in non-title fights and I see him being too much for John. Buckle up, because we are all set for UFC 187. 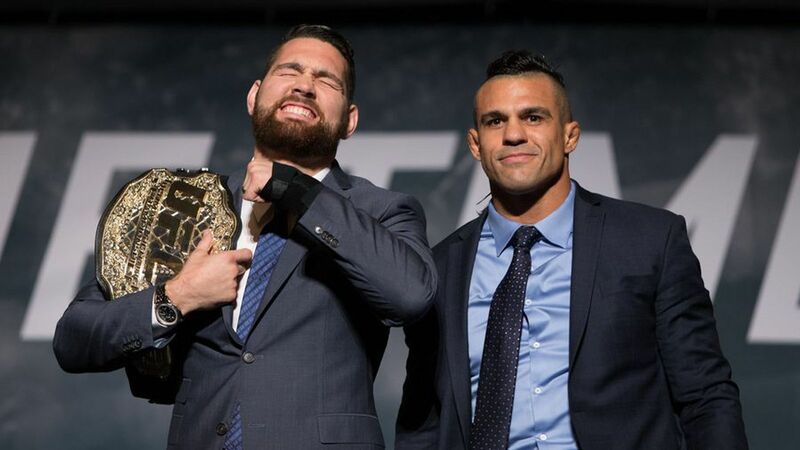 We are guaranteed a new Light Heavyweight Champion, but what's less of a guarantee is the reign of Chris Weidman—can Vitor Belfort stop him? UFC 187 will certainly be one not to miss. A complete guide to UFC 187: Johnson vs. Cormier—featuring previews, predictions, breakdowns and more.